Birth of a Visionary : On April 24, 1894, when a son was born to Pusapati Chinniah Raja, there was great jubilation in the family. Chinnaiah Raja believed that the child was born with the blessings of the Lord of Rameswaram, and named the child Ramasamy Raja. Little did anyone imagine that the infant was to one day change the face of Rajapalayam, a panoramic town on the foothills of the Western Ghats in South Tamil Nadu. Ramasamy Raja, known as PACR, was only 27 years old when his father died and all the onerous responsibilities of the family were thrust upon his young shoulders. Businessman turned into Industrialist: Ramasamy Raja was looking for something more enterprising than the family business. He therefore became an agent for Harvey Mills of Madurai. This move changed Ramasamy Raja's life. He realized the potential of his own lands. Instead of sending the cotton to Madurai to be converted into yarn, he realized that the same could be done in Rajapalayam itself. He concluded that Rajapalayam, which was otherwise a very backward area with very little job opportunities, would be vastly benefited by setting up a mill. Selfless Service to People: He carried out his responsibilities very efficiently and soon the people of Rajapalayam put him on a pedestal and respected him for his selfless service to the people. He was Chairman of Rajapalayam Municipality from 1941 to 1947. It was he who made Rajapalayam what it is today. Ramasamy Raja wanted to try his hand at business. He started off with a chain of provision shops and hardware shops. Along with his nephew, he started a transport corporation with five buses. Birth of the first Ramco Venture: His visited Britain and other European countries to see first hand the working of the mills. There, he had the chance to meet many business magnates. He returned to India full of ideas. After returning to Rajapalayam, he put his plans into action. To start the yarn mill, he found that he needed Rs.5 lakhs, which in 1936 was a huge sum. It was considered a Herculean task to raise such a big capital. But the determined Raja was not deterred. He decided to make the people "Shareholders". Rajapalayam Mills Ltd: Thanks to his illustrious background and his own reputation, he got the required capital ready, in next to no time. On September 05, 1938, the then State Minister for Labour, V.V.Giri, inaugurated the mill and Rajapalayam Mills Ltd commenced operations. There was no looking back for Ramasamy Raja after this. The Mill was a grand success. He followed this up with other successful ventures. He started The Ramaraju Surgical Cotton Mills Ltd along with his son-in-law Rama Raju. The Ramco Cements Limited : At that time, Cement was not considered as a favorable venture due to price controls. Shri. Manubai Shah, Central Minister for Industries, called upon Ramasamy Raja and appealed to him to start a cement factory. This was how The Ramco Cements Limited came into being in 1961. Ramasamy Raja needed Rs.1 crore as capital. The State Government for the first time in the history of India invested Rs.10 lakhs, an indication of the total trust and implicit faith the Government had in him. Concern for Shareholders and Workers: Ramasamy Raja had the well-being of the people upper-most in his mind. He was very particular that the funds of his shareholders be utilized usefully. He showed high concern for his workers. The famous trade unionist G Ramanujam once said, "In the case of Ramasamy Raja's companies, the workers are always thinking of the growth of the company, the Raja always has the well being of the workers and their families uppermost in his mind." Service to humanity: For Ramasamy Raja, religion and charity were part and parcel of his life. He realized that it was only education which could erase poverty and the pitiable condition of the people. He formed a trust and started various schools, colleges and polytechnics which today educate over 7000 students. He also started hospitals for the benefit of the people. 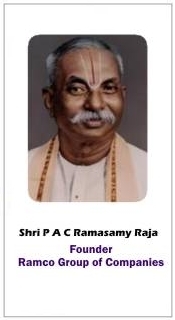 Realizing the dream of PACR: The Ramco Empire continued to expand under the leadership of PACR's son, the former Group Chairman, Shri P R Ramasubrahmaneya Rajha, who fulfilled the vision of PACR. Crossing the frontiers of Rajapalayam in PACR's time, the Ramco Group assumed national prominence. With the young guard now involved in the Group's activities, the process of globalization is on and the Group is taking the big leap onto the international horizon.